The intrigue surrounding five Hong Kong bookseller who disappeared only to resurface in police custody on the mainland has deepened over the past week. One of the five who went missing, Lam Wing-kee, returned to Hong Kong last Tuesday morning. It was reported that Lam went to the Hong Kong Police and asked them to drop his missing person case and that he did not need their, or the Hong Kong government’s assistance. Instead, he turned to Albert Ho Chun-yan — the same man Edward Snowden turned to three years ago — who arranged a press conference for Lam. At the press conference last Thursday, Lam said he was intercepted and abducted by a “central special unit,” not the regular police, at the Chinese side of the border crossing on October 24, 2015. Lam said he was handcuffed, blindfolded and taken from Shenzhen to Ningbo, near Shanghai, by train. For five months, Lam was confined to a room and monitored around the clock, without access to a lawyer or communication with his family. He said that a TV “confession” that was aired in February on Phoenix TV, a Hong Kong based television broadcaster, was scripted and under the guidance of a director; any deviation from the script would result in a re-take. After March, he was sent to work at a library in Guangzhou province. Lam said mainland police only allowed him to return to Hong Kong on the condition that he return to mainland China with a hard drive containing the details of customers from the bookstore he managed. According to Lam, he was on his way back to mainland China with the hard drive — containing the personal information of 600 customers — when he decided to call Ho. “This is not just my personal matter or Causeway Bay Books, this is about the human rights of Hong Kong people,” he said. 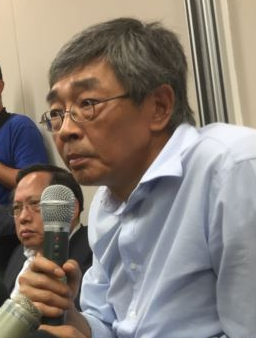 Lam said that it was a violation of the “one country, two systems” principle, adding that the Hong Kong government failed to protect him and the other booksellers. China has issued its own response, albeit one that skirts the issue of whether Lam and the four others were abducted illegally. “Lam Wing-kee is a Chinese citizen, and he has violated China’s laws on the mainland,” said Foreign Ministry spokesperson Hua Chunying at a press briefing in Beijing on Friday, referring to the mailing of banned books into China. “Relevant authorities in China are authorized to handle the case in accordance with the law,” she added. Hong Kong Labor Party lawmaker Cyd Ho Sau-lan shot back. “Mailing books is not illegal in Hong Kong, regardless of the books’ contents, and Lam mailed the books in Hong Kong,” she said. “The central government should also explain if the two people who followed Lam in Hong Kong were law enforcement officers because that would be indeed illegal,” Ho argued, according to the South China Morning Post. Lam has claimed that the other booksellers were also detained against their will and forced into confessions. Lee Po, another bookseller who also showed up on Phoenix TV with a confession, declined to confirm Lam’s claims, telling South China Morning Post reporters, “Talk about your story as you wish. I won’t make any comments. But don’t get me ­involved.” Lam said that Lee is being coerced as he has family members on the mainland. On Saturday, June 18, approximately 6,000 protesters took to the streets of Hong Kong in a show of support for Lam. Since October of last year, five men — all of whom either worked at, or owned Mighty Current Media, a Causeway Bay publishing house and bookstore that specializes in tabloid publications on China’s political elite — went missing under mysterious circumstances. The men, of varying nationalities, but all of ethnic Chinese descent, disappeared from mainland China, Thailand, and Hong Kong and turned up on Chinese television confessing and asking to be punished for a number of offenses that they had committed over the past 10 years. Lam is the fourth person to turn up since that time and is the only one to give a full, unvetted, and open press conference detailing his ordeal under the hands of Chinese authorities. The others have given exclusive interviews to pro-Beijing publications. Swedish National Gui Minhai, the fifth vanished bookseller, is still missing. Lam said that Chinese authorities had told him Gui would be sent to jail sometime between September and December. Gui’s daughter, Angela Gui, testified before a U.S. congressional commission hearing on China about her father’s disappearance in late May. She has also lashed out at China’s lack of respect for fair trial procedures.